Designed with the modern digital DJ in mind, the MDJ-1000 lets you perform using just one USB stick, and boasts a large, 4.3 in. color display that provides real-time visual feedback of your playing track. With MIDI capability and its ability to play CDs, the MDJ-1000 has amazing versatility that will appeal to pros and beginners alike. In play mode, the player’s brilliant, full-color screen shows track position on a large full size waveform with full track information including title, time, BPM and Pitch. In addition the display has visual feedback for Slip mode, Hot Cue points as well as active Loops. When browsing the display will show all your songs data including cover art. 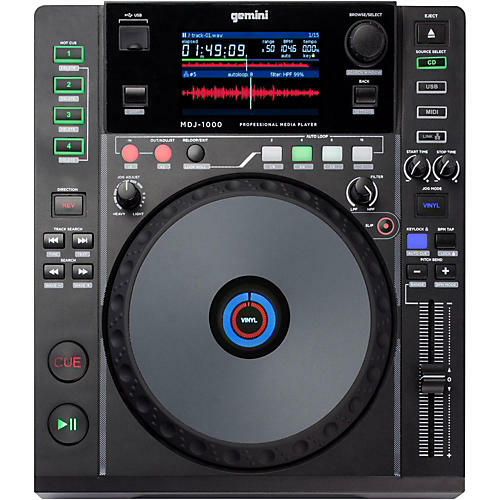 Gemini' MDJ-1000 focuses on ease of use; you can now use a single USB stick to share music between up to four players. The new LINK mode enables up to four players to be connected over Ethernet. When using two you can connect them with a standard Ethernet, when using up to four simply connect via a LAN Router. Sharing a music library is just the beginning. Connect up to four MDJ-1000' and enable SYNC to match the tempos for even smoother mixing. Freeing up precious time to get creative with four Hot Cues, eight Auto Loops, Slip and Scratch. Also, thanks to its MIDI capabilities, you can control the parameters of your favorite DJ software right from the unit and route your audio through its 24-bit/192kHz soundcard.